Friends, I have been considering changing up my eating for quite some time. I’ve been really curious about the keto or ketogenic diet and have felt like my body has been wanting me to give it a whirl. I didn’t understand quite how I was going to lose weight by eating lots of fat, some protein and very little carbs, so I did several weeks worth of research. I joined some Facebook groups too. But what really gave me that final nudge was “The Magic Pill” –a Netflix documentary that follows several people through the beginning stages of their keto journey. I found their results profound! What is the keto diet? Simply stated, it is a low-carb, high-fat way of eating. People following this diet burn through their small portion of carbs quickly, so their body then switches to fat for energy. And when this occurs, it’s said the body goes into a state of ketosis. Many people who follow a keto diet have weight loss success and a host of other benefits. Not everything works for everyone, but I hope my body is one of those that finds success. I’ve finally come to the point where I just have to try! 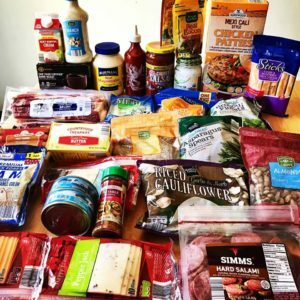 I spent the past week reading everything I could on the subject while eating up the foods in my cupboard that are not good ingredients for keto. By the end of the week, our cupboards looked like that of Old Mother Hubbard! Our poor teenage son began to get concerned. Although he will continue to eat his way, I’m excited my husband is joining me on this adventure! Eric and I took a trip to Aldi yesterday to see what we could find for our first week of keto. We read lots of labels. LOTS! And we may not have made expert choices, but we managed to leave the store with a selection of items that, teamed with what we already had on hand, will provide us a good variety to keep us from getting bored the first week. Armed with an array of choices, we kicked off our adventure this morning. Ordinarily, when I begin a new eating plan, I’m nervous. But, Friends, I am intrigued! I’m about to eat so many foods I previously thought detrimental to my health…seems to go against nearly everything I knew about healthy eating. We shall see! 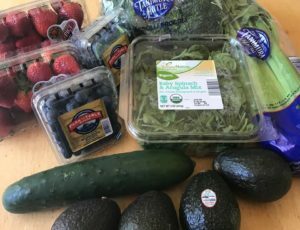 I documented yesterday’s grocery haul and today’s breakfast/lunch on the Facebook page and was surprised by the response. I had friends and followers reach out, my inbox was inundated with a flood of folks offering support, encouragement, advice and even multiple cookbooks coming my way! They really made my day! Breakfast was a flavor filled mushroom and cheese omelette with bacon and coffee…yum! Lunch was an experiment using a sliced Mexi Cali chicken patty on a bed of spinach and arugula with avocado, blueberries and ranch. It was so amazing, I plan to make it for dinner tomorrow night so Eric can experience it too! 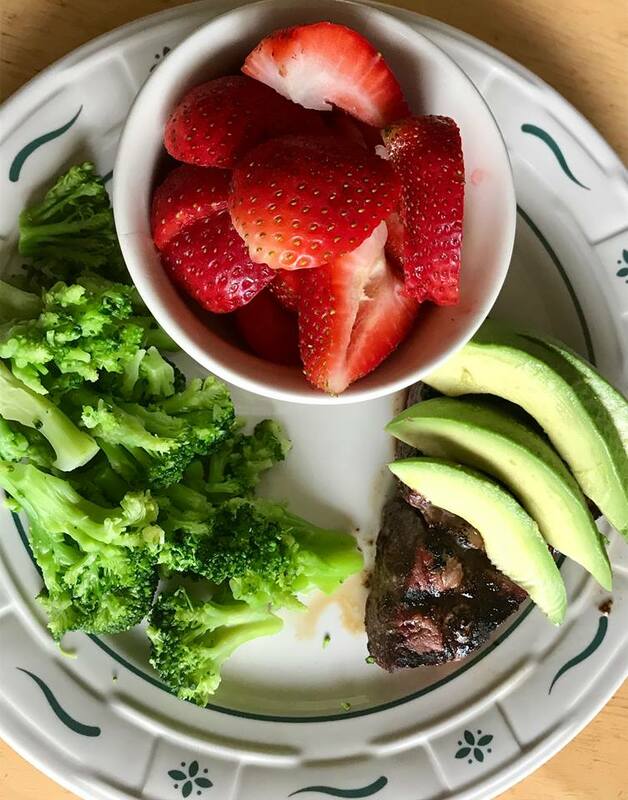 I didn’t photograph the walnuts and almonds I had for a snack, or the many ounces of water I sipped, but I rounded out my day with a sirloin steak, avocado, broccoli and strawberries. And I am FULL. I’ve actually felt full all day. 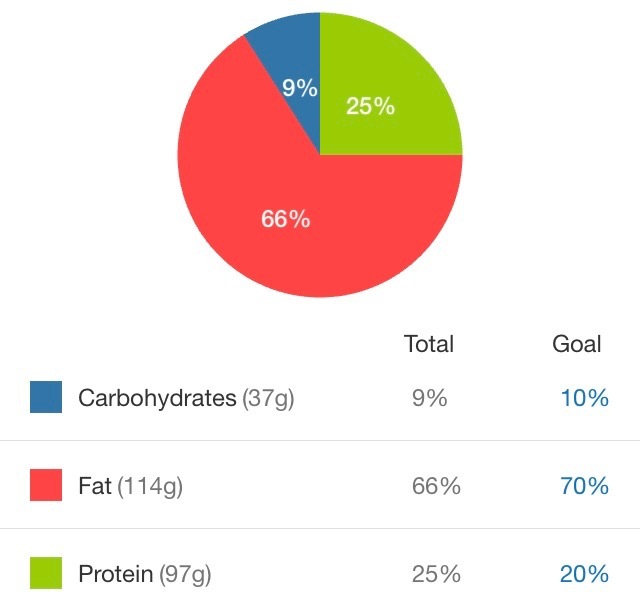 And on 1580 calories, I’ve never really been able to say that before! Here’s a look at how the day measured up. Not bad for my first attempt. True confession…I took today off from work, so I’m not sure how tomorrow will go when I don’t have an abundance of time to prepare meals. But I’m not too concerned. I actually welcome the challenge and look forward to feeling how my body performs tomorrow when I put it through a tough workout fueled by fat! I’m already thinking very good thoughts! 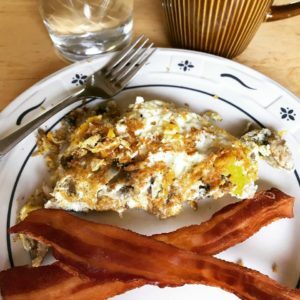 Have you gone keto? If so, feel free to leave a comment below. I’d love to hear how it went or is going for you! 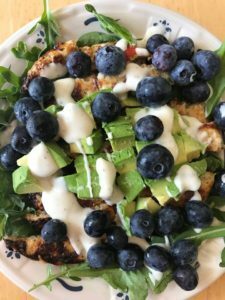 This entry was posted in Healthy Eating and tagged fueled by fat, healthy lifestyle, hflc, high fat low carb, keto, ketogenic diet, ketones, ketosis, lifestyle change, macros, mindfulness, wellness. Bookmark the permalink. My snacks at work are almonds or frozen berries with hwc. Lunch in a pinch-can of tuna with mayo or avocado. Over greens if i have them.